In May 2017, Hempworx merged with My Daily Choice (MDC). 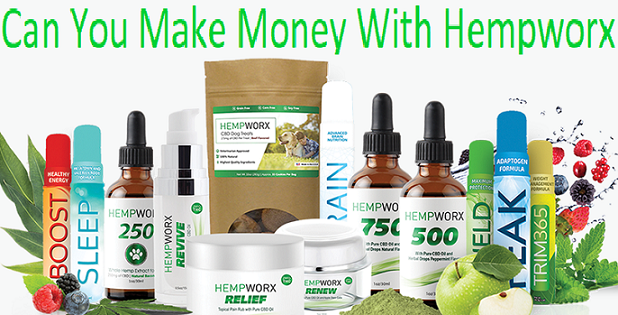 As a result you can now purchase Hempworx with all the other MDC products. Based on our research, MDC offers the option to focus all your energy on Hempworx. MDC just runs the system in the background. Hempworx provides high quality CBD oils made on their hemp farms in Kentucky. It’s important to remember that Hemp, and CBD oils, come from a strain of the Cannabis plant that contains very little THC. This means that the products will not have ‘recreational’ side effects. The Hempworx business opportunity is simple enough. According to their page, it’s a chance to be part of the fast growing cannabis industry. Hempworx tells us that the Cannabis industry will expand by 700% by 2020 If you become a Hempworx Affiliate, then you can have your own piece of that pie. My Daily Choice will help you promote your Hempworx products with their online tools. They’ve created a Hempworx ‘business in a box’. If you sign up, you’ll get a copy of their pre-made webpage, as well as an app for your phone and some tracking tools. While this is all well and good, it’s nothing new. We’ve seen these tools offered by other MLMs too. We want to know what makes Hempworx a good business opportunity. To find out how we can make money, we looked at the Hempworx compensation plan. This document explains all the commissions you can earn from Hempworx, as well as how to qualify for them. To join Hempworx, you’ll have to pay a once off joining fee of $20, which they say is to set you up with all their systems, and their ‘success starter kit’. You will also need to buy some product. Depending on which starter pack you choose, you’ll spend anywhere from $69 - $599 on product. The deal with the starter kits, is that the more you spend the more Business Volume (BV) points you’ll earn. We’ll learn more about BV points as we go along. As a new affiliate, you’ll probably find that your sponsor, and several people in your upline are all encouraging you to purchase product and get yourself set up early. While it may sound like they are being helpful and taking an interest in your new venture. It’s important to remember that they are earning commission from your spending. When you recruit new Hempworx affiliates, you can place them either on your left leg or your right leg. In theory all you need to do is concentrate on the outer legs. If the people you recruit also go on to recruit new affiliates, then they will fill the inner parts of your legs for you. Once you’ve purchased your qualifying quota, you’ll be able to start earning commission from the people in your downline. To earn a binary commission, you need to have at least 300 BV on both your downline legs. If your legs have different BV values, then your ‘paid leg’ will be the one with the lower volume. 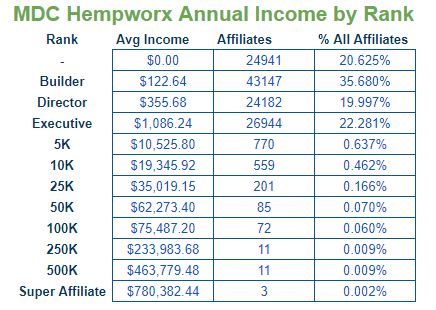 The first thing we notice here, is that after a bit of addition, we find that 99.85% of Affiliates earned less than a full time annual income with MDC / Hempworx. This may well be one of the most aggressive compensation plans in the industry, but only 1/666 affiliates earns more than they would with a regular job. The income disclosure statement only includes affiliates who remained part of Hempworx / MDC during the time the figures were measured. It does not factor in those who quit. If we were to include these, then things only get worse. MDC tell us that over 70% of affiliates quit Hempworx within their first 12 months. We can safely assume that they earned very little if any commission at all. Another thing we notice, is that it’s lonely at the top. Of the 120,926 MDC affiliates included in this income disclosure, only 3 have reached the top ‘Super Affiliate’ rank. While the presentations may show you how much you can earn if you climb the ranks, very few ever achieve this. To us, this feels like Hempworx are dangling carrots. We applied Jon Tayolors 5 Step MLM evaluation to Hempworx, and found that it raises all 5 flags. According to research this means that your chances of turning a profit with the MDC opportunity are less than 1%. The market for cannabis and related products is one of the fastest growing in the world. This however is not a guarantee of success. We should not assume that just because Hempworx is involved with CBD oils, you can automatically be successful with this opportunity. Even if Hempworx as a company is successful and turns vast profits, this does not mean you can make money with the MDC opportunity. At the end of the day MLM is designed to make you a customer, not a business partner. If you sign up to be a Hempworx affiliate and spend your monthly BV, then you’ll be buying their products, and sending them profits. You will not make any money unless you are very good at selling both the products and the opportunity to others. Another problem is the high attrition rate. More than 70% of the new affiliates you recruit will quit within 12 months of joining Hempworx. This makes building downline more difficult because it’s not enough to just recruit. To grow your business you need to first replace all those who quit each month. Even though MLMs resemble illegal pyramid schemes, they are legal as long as there is a product or service attached to them. We don't think that Hempworx affiliates are trying to scam their new recruits. It's more likely that they themselves believe that this opportunity will one day make them wealthy. Being legal does not make MLM ethical. All companies are in business with the goal of selling goods and services for a profit. Network marketing companies are able to charge a higher price because they create a customer base of loyal members who believe that by consuming these products and recruiting others to do the same, they will become financially free. In reality you are more likely to lose money and quit within your first year.